“Eat your veggies!” A colorful diet of fresh fruits and vegetables has been shown to improve health, including reduced risk for heart disease, some types of cancer, obesity, and high blood pressure. One major hope when we opened Carver Market was to make quality fruits and vegetables available to our neighbors when no other retail store was offering produce to our community. In our first eight months of operation, we learned that customers who paid with cash or credit typically spent about 15% of their purchase on produce. The number was half (7%) for those customers shopping with SNAP (Supplemental Nutrition Assistance Program) Benefits. We suspected that part of this discrepancy related to unfamiliarity and a hesitancy to spend limited grocery dollars on experimental vegetables. Through a partnership with Georgia Food Oasis, we began offering Thursday 2 for 1 deals on produce for SNAP customers, effectively doubling their buying power for fruits and vegetables. Immediately, we saw the average transaction - regardless of payment method - include a whopping 20% in produce! Since then, we’ve been working hard to build on this success and expand the program. It’s exciting to watch our small, local start-up begin to develop valuable, sustainable solutions that nourish families. 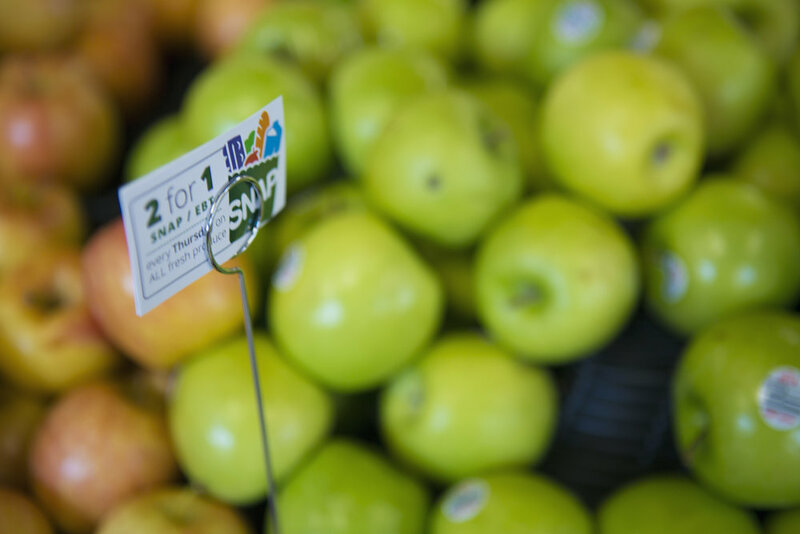 We’re thrilled to announce we are now offering 2 for 1 produce for all SNAP shoppers every day of the week. The benefits of expanded 2 for 1 days reach both families and the broader community. On an individual scale, it allows our customers the freedom to shop any day of the week, providing the same level of dignity we value in all of our programs. Looking to the whole community, we hope this increased access to affordable produce will extend our geographic reach for serving SNAP shoppers. We are also eager to see how these changes affect traffic patterns in the store. We are always learning more about what works for our customers, and we work hard to provide the best quality products and local service. We are so happy to watch this program - made possible through our partnership with Atlanta Falcons Youth Foundation - grow. And we are encouraged as we watch local shoppers try new foods, experiment with healthy options, and adjust their eating habits to create a more healthy lifestyle. This type of health transformation wasn’t possible a few years ago when fresh fruits and vegetables were hard to come by. We’re grateful to be a part of bringing healthy eating to South Atlanta!